Manage campaign logic and delivery including audience segmentation against the largest contact databases, ad-hoc field creation, exclusions, assignment of offers and channels, and the execution of email, mobile push and SMS campaigns. Accurately measure and report on marketing activities to enhance insights, decision making and marketing accountability. Create stronger customer relationships, loyalty and lifetime value with access to an extensive interaction history including offers presented, campaign details, and response or non-response data. Bring campaigns to market quickly with a centralized repository of campaign management building blocks including audiences, segments, offers, treatments and exclusion rules. Create offers based on templates with both standard and custom attributes, and generate offer attribute values. Leverage seamless integration with Watson Campaign Automation for digital channel execution including email, mobile push and SMS. Enjoy rapid campaign import and integration across journey designer, data for reporting, social audiences and more. This powerful integration allows marketers to maximize the benefit of IBM Campaign for their organization. Design and manage complex, multichannel campaigns with greater flexibility and ease. Reduce campaign cycle times and overall time-to-market with best-in-class campaign management functionality. 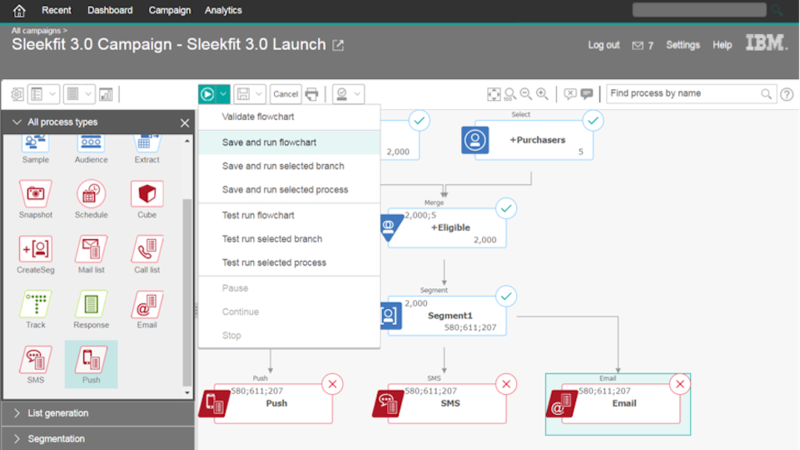 Use the new Marketing Software Director to monitor the Campaign environment, zoom in on flowcharts, Campaign listener status, database and web application servers. Tune performance and solve environmental and flowchart issues fast. Flowchart Health Checks save time with the ability to drill down to view process details including run time, average run times and flowchart status. Admins can start, stop, pause and restart flowcharts. Admins can easily move objects from environment to environment. Tools are available to assist IBM Campaign customers in removing end-customer (data subject) data from application system tables quickly and efficiently. This is designed to assist marketing teams to meet various operational requirements of the EU GDPR. Evaluate activities across any data point including segments, products, channels, brand and time. Attribute direct, indirect and inferred responses to specific campaigns using attribution methods. For some enterprises, application ownership is required to be managed in-house. For others, fully cloud-based is desired. We offer total flexibility in ownership and deployment so that organizations can select the approach that is optimal for their business needs. For organizations that need to manage the upgrade of their Campaign application, capabilities are offered to streamline and accelerate this process. It is easier and faster to keep current to access the latest product innovations. Click the link below to see a complete list of software requirements for IBM Campaign. Click the link below to see a complete list of hardware requirements for IBM Campaign.